PX Technician Series Xtreme Power C3 5W-40 is 100% fully synthetic motor oil that utilizes a unique technology with special molecular formulation to maximize the protection for engines under extreme conditions. The adhesive bond with metal at a molecular level forms a strong protective film over all surfaces in the piston chamber, ensuring no metal to metal contact. It delivers optimized protection in performance engines under ultra-high load and maximizes power output in all conditions. 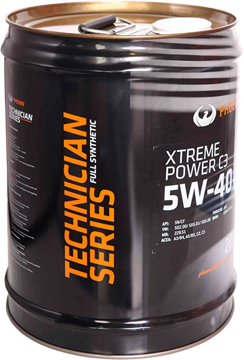 PX Technician Series Xtreme Power C3 5W-40 contains the highest quality synthetic fluid providing a much stronger oil film than conventional mineral products. The oil has excellent film resistance at high temperatures which minimises oil consumption.